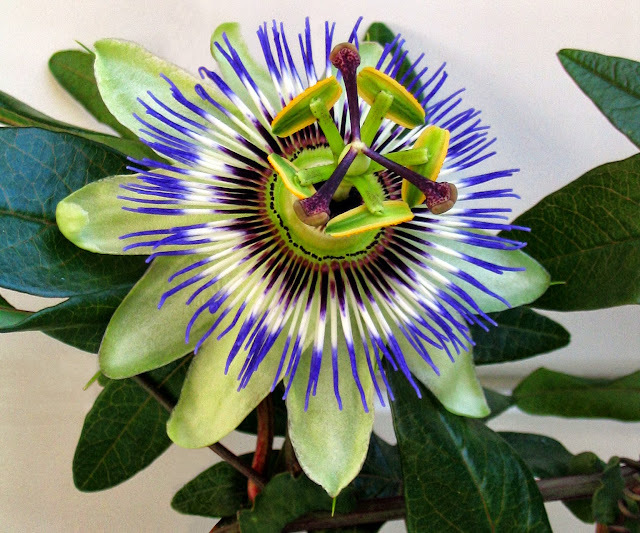 The sublime climbing passion flower - Passiflora caerulea is not only a true summer gem for the English garden, it is also one of the easiest plants to grow. Evergreen in all but the coldest regions (although they generally suffer some cold damage), the passion flower is one of those plants that really gets close to offering that elusive all year round effect. It begins in late spring with the production of extravagant, deeply lobed, glossy green leaves and these are followed a month or so later by a proliferation of showy, creamy-white flowers, delicately centred by purple-blue zoned coronas. 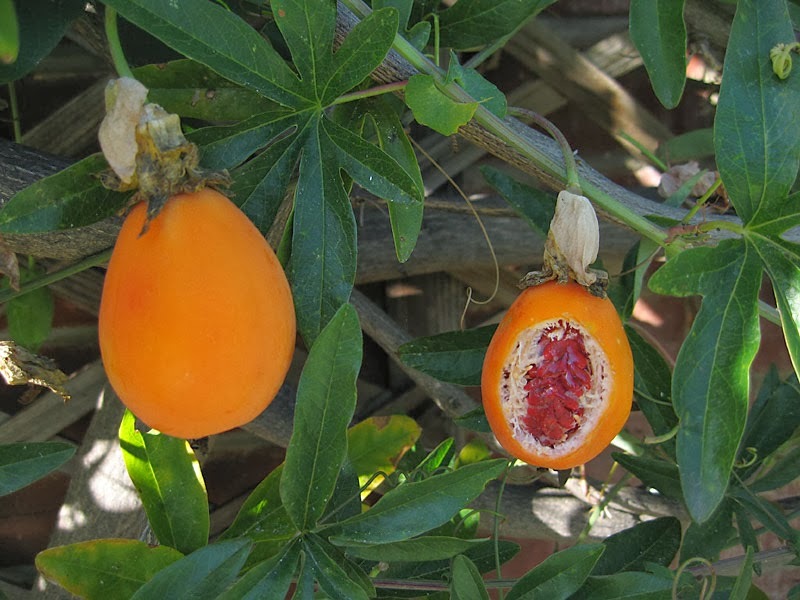 Given a half-decent summer you can also expect the passion flower to produce its golden, egg-shaped fruits. Not only are they edible, but the plant will continue to turn out those beautifully exotic flowers for as long as the warm weather will hold. Plant it against a sheltered south-facing and you can't help but bring a touch of the tropics to your garden. 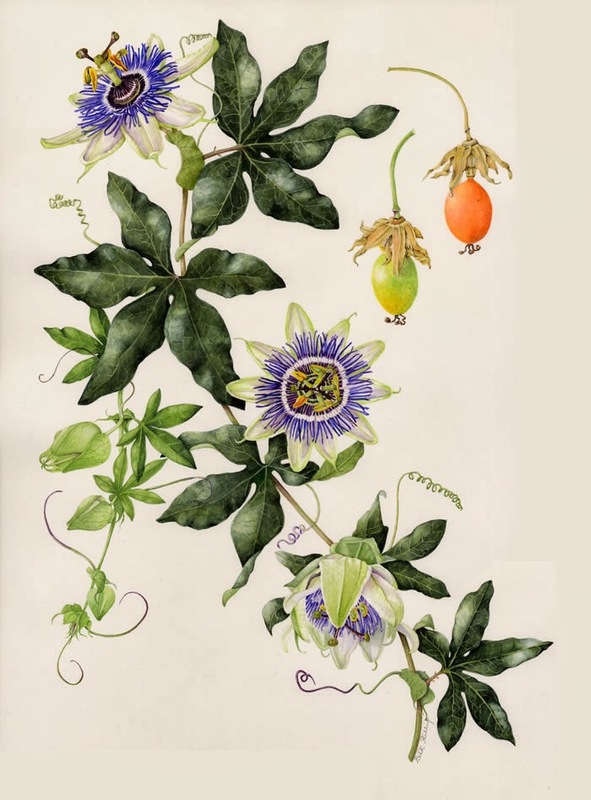 Like most true species plants, Passion flowers will grow true from seed. Unfortunately, as their true ‘roots’ lie in the tropics there was no need to evolve seed capable of surviving harsh seasonal changes and so their long term viability is not as good as what you would expect from northern European plants. That being said, so long as the seed is reasonably fresh there are few tried and tested techniques that can be used to dramatically improve the viability of passion flower seed that has been subject to storage. The main problem with passion flower seeds is their dormancy period which can be anywhere from 2 -12 months if the seed isn't germinated straight from the fruit. Perhaps the best method to break this dormancy as well as improve overall germination is to lightly sandpaper the seeds on either one or both sides using a fine sandpaper, and then to soak them in tepid water for around 24 hours. Any seeds found floating will not be viable and can be discarded. Prepare a seed tray using a good quality seed compost, planting each seeds no more than ¼ of an each deep. You may wish to mix in a couple of handfuls of perlite or horticultural grit at this stage to help with drainage. Gently water the seeds in, then cover with clear plastic to maintain humidity. Remember that the plastic must be removed at the first sign of germination to prevent fungal rots appearing. Keep an eye on watering as the compost must remain moist during the germination period. Temperature is the critical factor here which would ideally be at 20 degrees Celsius for 16 hours a day with an additional 8 hour period at 30 degrees Celsius. Without specialist equipment this becomes impractical but if you time your season right (i.e. sow at the beginning of the warmest months) or use either a standard soil warming cable or thermostatically controlled propagator, then a constant temperature of 26 degrees Celsius should do the trick. When using this technique on fresh seed you can expect germination within two to four weeks, but older seed will take between four and eight weeks. Do get too worried if yours are taking longer as periods of 12 to 48 weeks are not exceptional. As soon as the new seedlings start to show through, keep them out of direct sunlight until the second set of ‘true’ leaves have appeared. Now the seedling can be transplanted on into 9 cm pots and grown on for 2 -3 weeks before planting outside. There is a history of poor flowering with passion flowers grown from seed as it can take many years before some individual move from their non-flowering, juvenile stage to their flowering mature stage. This can be as long as 8 years and in rare cases the seedlings may never flower. With this in mind it is worth planting out between 4 and 6 plants with a view to keeping just 1 or 2 specimens later on depending on your preferences. Expect there to be a normal amount of variability between the seedlings, but you may be surprised at just how different they are!